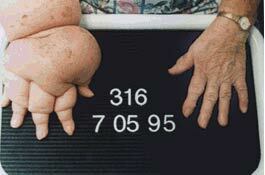 Lymphedema, a protein-rich swelling which usually affects the extremities, is a very common condition worldwide. Complete Decongestive Physiotherapy is done successfully in Europe for decades in the treatment of primary and secondary Lymphedema. 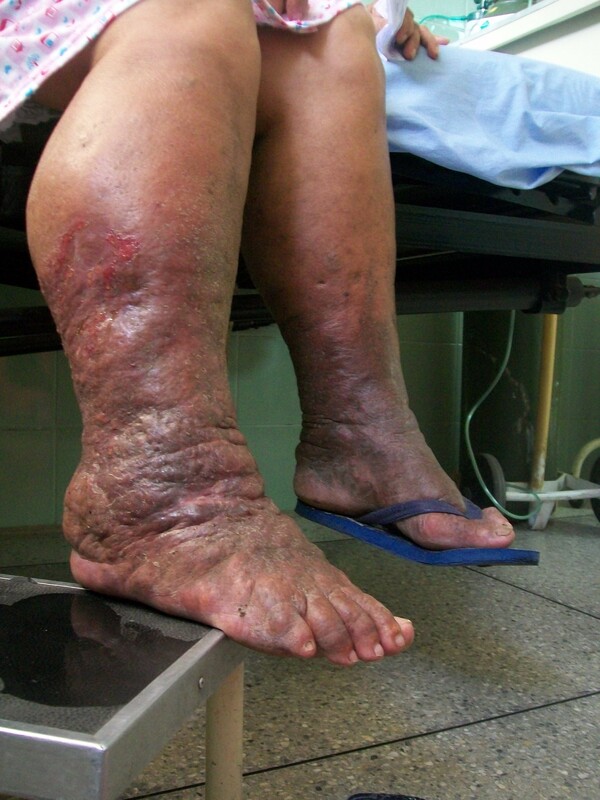 Chronic peripheral lymphedema, an accumulation of protein-rich fluid in the superficial tissues, is a very common and serious condition with significant consequences for the patient. One of the main reasons for the development of lymphedema are surgical interventions in combination with lymph node dissections, such as mastectomy or lumpectomy due to breast cancer. Although reliable statistics on the overall incidence of lymphedema are not available, conservative numbers estimate the incidence of secondary upper extremity lymphedema to be around 1 per cent of the population. In addition to that there is a large number of patients suffering from primary lymphedema, which usually affects the lower extremities and is caused by congenital malformations of the lymphatic system. Complete Decongestive Physiotherapy (CDP), done successfully in Europe for decades, is a non-invasive therapy with long lasting results. CDP is superior to all other approaches to treat lymphedema (pumps, medication, surgery) and designed to reduce and to maintain the reduction of the swollen extremity. At the end of the 19th century, Alexander von Winiwarter, Professor of Surgery, already described the basic steps of this therapy of swollen limbs with special massage, compression, and elevation. The technique was improved in the 1930s by Vodder, a physical therapist from Denmark, who successfully treated lymphedema. In the 1980s Prof. Michael Foeldi, M.D. considerably improved this therapy by developing a technique called Complete Decongestive Physiotherapy, which even in advanced stages of lymphedema shows remarkable results. For the safety of the patients and to achieve good results it is absolutely mandatory that the therapist is thoroughly trained in all components of CDP. Only certified MLD/ CDP therapists have a complete understanding of the pathophysiology of lymphedema and its treatment. Since the elastic fibers of the skin are destroyed during the course of lymphedema it is mandatory to apply sufficient compression to the affected area in order to prevent re-accumulation of fluid. Compression in phase one is achieved by short-stretch bandages applied after each treatment. It consists of 4 layers of material that protect lymphatics, offer gradient compression, and soften the skin. Bandaging does not permit the treatment areas to refill with fluid. After the extremity is decongested the patient if fitted with a sufficient compression garment that needs to be worn during the daytime. At night the patient applies mild compression using bandages. Before treatment can be started, the skin has to be free of infections or fungal affections. During treatment a low-pH lotion is applied to maintain the moisture of the skin. 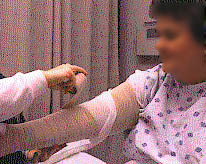 Remedial exercises performed by the patient wearing the compression bandage or garment aid the lymphokinetic effects of the joint and muscle pumps. Muscle activation with the bandages in place provides resistance. 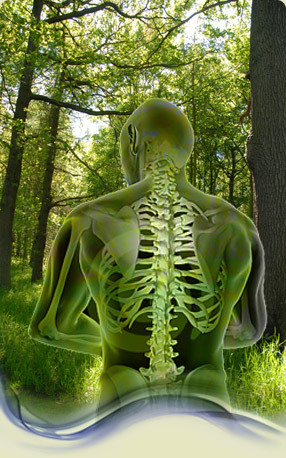 When resistance is met, increased lymph flow and reduction is the result. Patients being treated for arm lymphedema are asked to bring a short sleeved garment for exercises. If you do not wish to wear the short sleeved garment out of our facility, clothing with loose fitting arm sleeves is required. Patients being treated for leg lymphedema will need shorts or loose fitting pants for exercise therapy. When leaving our facility, a skirt could be worn if desired. Leg patients will need very large sneakers, sandals, or something comparable. Unlike the blood system the lymphatic system works according to the one way principle, its main purpose is to transport "waste materials" from the interstitial tissues back into the blood system. Initial lymphatic system: Lymph vessels start in almost every tissue as lymph capillaries. These initial lymphatics are made up of endothelial cells which overlap each other. Lymph capillaries do not have a continuous connection like blood capillary endothelial cells do. A surrounding fibre net, anchoring filaments, arranged around the lymph capillaries, enables these small vessels to stay open, even under high tissue pressure. The pumping is aided by a large number of valves located inside the collectors which allow the lymph flow in only one direction. After passing a large number of lymph nodes, where foreign substances like bacteria, are filtered out and necessary immune reactions are activated, the lymph fluid empties into the venous system, mainly via the thoracic duct. Shifting of Starling's equilibrium towards an increase in ultrafiltration, e.g. increased blood capillary pressure (inflammation, venous hypertension) or decreased colloidosmotic pressure (hypoproteinemia), can cause an increased amount of water and proteins, thus creating a higher burden on the lymphatic system. A healthy lymphatic system is, for some time, able to prevent the onset of edema, under normal conditions the transport capacity (TC) of the lymphatic system is approximately 10 times higher than the physiological amount of the lymphatic loads (LL) of water and protein = functional reserve (FR) of the lymphatic system. Any lymphedema left untreated gradually worsens and will have significant consequences.The first stage of lymphedema (reversible stage) is characterized by a smooth texture of the tissue, the lymphedema is "pitting" and may vanish more or less over night. If protein rich edema persists, the congested protein molecules are replaced by fibrotic tissue, i.e. the lymphedema becomes harder (stage II) and in addition to that patients are prone to developing frequent infections which additionally worsen the condition. 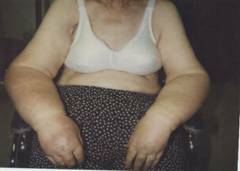 Typical for the third stage of lymphedema, lymphostatic elephantiasis, is an extreme increase of the swelling combined with skin changes, loss of function and other complications.